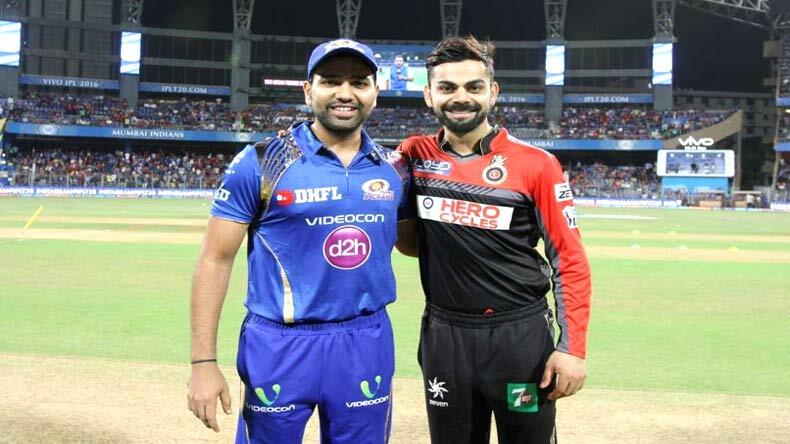 A winless Mumbai Indians go up against a struggling Royal Challengers Bangalore in Match 14 of the VIVO IPL 2018. Both the sides haven't quite found their feet in the tournament are still seen experimenting with their batting and bowling lineups. In a match that promises to be another exciting thriller, lets take a look at how the two sides stack up against each other. While Rohit's batting woes have been a worry for MI, Virat hasn't clicked with the bat as both franchises lie at the bottom of the table. 3-time title holders Mumbai Indians are yet to win a match in this edition of the league. The defending champions will look to get their first points on the table when they face off against the Royal Challengers Bangalore at their home ground Wankhede in Mumbai. Both teams are yet to find their feet in this carnival as both of them are struggling with getting their combinations right. While batting failures have been a worry for MI this season, it’s the bowling which has been a perennial concern for their opponents. No matter what they do, what tactics they employ, and what buys they make in the auction, the RCb bowlers go for plenty in general, whenever they take the field. The story for MI, however, has been a thrilling, yet disappointing one as all their matches went down till the last over. If it was Dwayne Bravo in the first match, then Deepak Hooda and Jason Roy made sure that they follow suit by sealing victories for their sides off the last ball. Rookie leg-spinner Mayank Markande has been their most successful bowler so far and they would like Jasprit Bumrah and Mustafizur Rahman to join the party pretty soon. The duo who has been Rohit’s go-to bowlers in the death have picked only 8 wickets in between them, at an economy of 7.7. Coming to the batting, everyone except their skipper has been amongst the runs, with youngsters Surya Kumar Yadav and Ishan Kishan leading the charts for the side. The dynamic Pandya bros. and the big West Indian Kieron Polllard are also yet to make a mark in the tournament. In the last match, however, even after making a record 84 in the powerplay, MI batsmen failed to capitalize on the blistering start and couldn’t even cross 200, thanks to a late order batting collapse where they lost 5 wickets for 28 runs in the last 5 overs. Coming to their opponents, after beginning their campaign with a loss against KKR where Sunil Narine once again ambushed them, RCB made a winning comeback by registering a win on their home ground against the Kings XI Punjab. In their last match, however, they met with a certain Sanju Samson who hammered their bowlers to all grounds, hence taking Rajasthan to a winning total of 217. And once the prolific pair of Kohli-de Villiers got out, their chances of winning also went down, despite some heroics from Washington Sundar and Mandeep Singh towards the end; hence proving the fact that has quite been the story since eternity – their batting heavily depends on Virat and AB. Umesh Yadav, who was their best bowler in the previous two outings went for 59 off his four overs which include the 27 he gave away in the final over. Apart from Yuzvender Chahal and Washington Sundar, no other bowler can boast off a good economy rate or even consistency. Young gun Kulwant Khejrolia has been expensive in all the three games whereas their highest wicket-taker – English all-rounder Chris Woakes has also bowled with an economy of 10.5. CONDITIONS: Even as it is going to be an evening game, the temperature wouldn’t drop below 28 degree Celcius for most parts of the match. And it is going to be humid. HEAD-TO-HEAD: Out of the 22 instances when both the teams have faced each other, MI has won on 13 occasions while RCB has managed to win 8. MI have been known as slow starters in the IPL but it is time they shrug it off before it is too little too late. Mumbai Indians- The move to bring in Sri Lankan leggie Akila Dhananjaya clearly didn’t work out for them. Rohit will probably look at Mitchell McClenaghan to strenghten the fast bowling arsenal or bring in the experience of JP duminy who provides options with both bat and ball. Probable XI: Evin Lewis, Suryakumar Yadav, Ishan Kishan, Rohit Sharma, Krunal Pandya, Kieron Pollard, Hardik Pandya, Mitchell McClenaghan, Mayank Markande, Mustafizur Rahman, Jasprit Bumrah. Royal Challengers Bangalore: Their top-4 are as good as any you can find in the competition. However its the bowlers who need some backing. Kulwant Khejrolia has been given enough opportunities, yet proved ineffective and should be replaced by Navdeep Saini or Aniket Choudhary. Probable XI: Virat Kohli(c), Quinton de Kock(w), Brendon McCullum, AB de Villiers, Pawan Negi, Mandeep Singh, Chris Woakes, Washington Sundar, Navdeep Saini/Aniket Choudhary, Umesh Yadav, Yuzvendra Chahal.